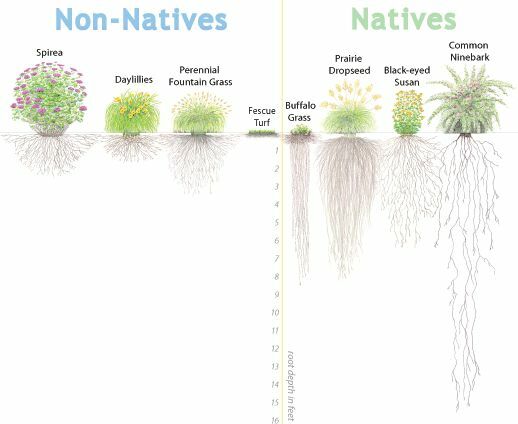 ​What is a native plant? Hundreds of years ago, the vast acreage of Minnesota was covered in “native” plants–the grasses, foliage, and trees indigenous to our region–before modern settlement disturbed their natural habitat. Native plants differ from non-natives because of their complex relationship with other local organisms, acting as critical components in maintaining nature’s delicate eco-balance. Native plants help clean water with their deep root systems that anchor soil and act as filters, collecting dirty run-off and separating out pollutants while absorbing water and decreasing flooding. Native plants also provide pollen, nectar, and housing materials to the bees, butterflies and other animals that are responsible for pollinating 1/3 of the food we eat. What are the benefits of native plants?